Doris Fogel will speak at our Annual Holocaust Commemoration which will be followed by the traditional candle lighting service. Please plan to join us 6:30pm April 11, 2019 at Temple Beth El, 5150 Calkins Rd. Doris (Warschawski) Fogel, at the age of four, and her mother left Berlin in 1939. They arrived as “Stateless Refugees” in Shanghai, China. She spent the next eight (8) years in the Hongkew Ghetto living in internment camps (Heime) among the starving Chinese citizenry, in a city without benefit of running water and modern sanitation facilities. Locally and around the Midwest Doris speaks to thousands of students annually. In 2008 Doris was widowed. Doris has three grown children who are all successful professionals in Chicago. She has eight (8) grandchildren whom she sees as often as possible. For nearly five decades Doris was active in Ft. Wayne, In various Jewish and philanthropic organizations. 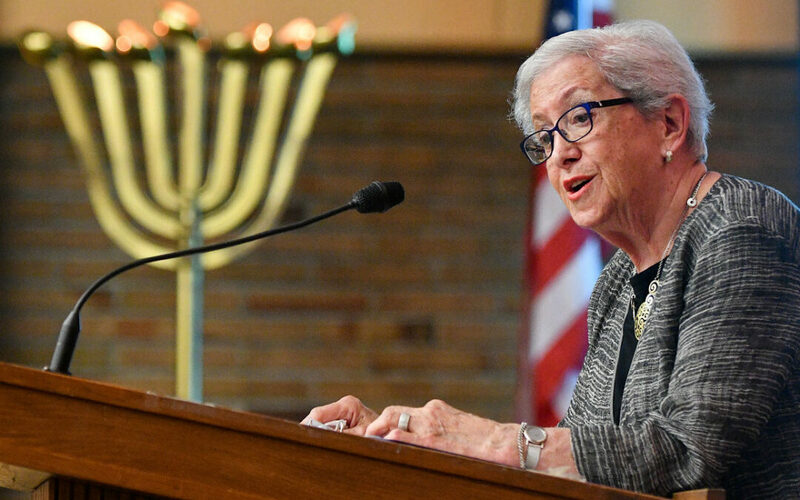 In particular, she has twice served as president of Congregation Achduth Vesholom, the Reform Temple in Ft. Wayne, as well as serving as president of the Ft. Wayne Jewish Federation for six (6) years. Shortly thereafter Doris was hired as the Executive Director of the Ft. Wayne Jewish Federation. Doris retired in 2013 and moved back to Chicago to be near her three children and eight grandchildren. Presently Doris is a speaker at the Illinois Holocaust Museum and Education Center as well as traveling around the country to speak at annual Yom Hashoa Commemorations and schools.